Alyssa Crittenden (left) and her undergraduate student, Elle Ford, work on growth and development data in the lab. 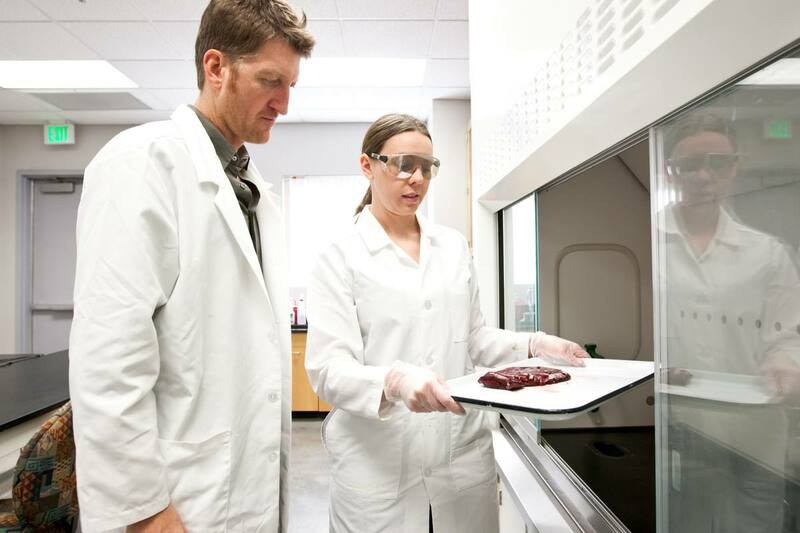 Daniel Benyshek (right) and his former Ph.D. student, Sharon Young, getting ready to prepare lab samples of placenta for analysis. The Nutrition and Reproduction Lab, under the direction of Daniel Benyshek and Alyssa Crittenden, explores multiple aspects of maternal and infant health and nutrition. Our research examines dietary factors that play critical roles in human health and disease. We conduct both experimental animal research and studies with human research participants to explore the effects of diet on maternal and child health, especially during and immediately after pregnancy. Obesity-related disorders such as the metabolic syndrome and type 2 diabetes have reached epidemic levels globally (well over 1 billion people are overweight or obese by World Health Organization standards). Research conducted in the Nutrition and Reproduction Laboratory includes work on the role maternal prenatal and early postnatal nutrition plays in susceptibility to – and protection from – obesity-related diseases. Much of the research currently being conducted by Dr. Benyshek and his colleagues and students is focused on how obesity-related disorders like type 2 diabetes are passed on (via developmental plasticity) from one generation to the next. The majority of Dr. Benyshek’s research in this area has utilized experimental animal models to understand the developmental origins and transgenerational heritability of obesity-related metabolic disorders in the world’s highest prevalence communities. Important findings from his work in this area have been published in the journals Diabetologia, the Journal of the Developmental Origins of Health and Disease, Nutrition and Metabolism, and the Open Journal of Endocrine and Metabolic Diseases. Recently, Dr. Benyshek, along with a host of graduate students and a team of UNLV researchers, including colleagues in UNLV’s School of Public Health (Dr. Michelle Chino, and Dr. Carolee Dodge-Francis, as well as community partners such as the Las Vegas Indian Center) worked with Native American community members living in the Las Vegas area whose blood sugars were high (“prediabetes”), but not yet at diabetic levels. The two-year, National Institutes of Health (NIH) funded project sought to understand what special challenges and opportunities urban Native Americans face in their efforts to keep their higher than normal blood sugar levels from increasing to that of type 2 diabetes through well-established diet and lifestyle modification programs that have been successfully implemented in several Native American reservation communities. Key findings from the study are published in the Journal of Diabetes Mellitus. Daniel Benyshek calibrating a laboratory centrifuge in preparation of whole blood samples. Another of Dr. Benyshek’s current research projects investigates the practice of human maternal placentophagy (eating the placenta or ‘afterbirth’ following parturition). While maternal consumption of the placenta is a common practice among nearly all terrestrial mammals, it is unknown as a ‘traditional’ human practice cross-culturally. Over the last several decades, however, it has emerged as rare but increasingly popular practice among some women in industrialized countries who self-report a host of maternal health benefits. Dr. Benyshek’s research group, which includes graduate students and colleagues Dr. Chad Cross (UNLV School of Medicine), Dr. Shawn Gerstenberger (UNLV School of Public Health), Dr. Sharon Young (Nutrition and Reproduction Lab), Dr. Melissa Cheyney (Oregon State University, Anthropology), and Dr. David Zava (ZRT Laboratory in Beaverton, OR) have partnered with Jodi Selander, founder and Director of Placenta Benefits, a resource and information website on maternal placentophagy and placenta encapsulation services, in order to investigate the possible beneficial health effects and/or risks of human maternal placentophagy. Several members of the research group recently concluded the first double-blind, placebo-controlled pilot Randomized Clinical Trial (RCT) investigating the effects of the postpartum practice on maternal health. Results from this landmark study have been published in the peer-reviewed medical journals, Women and Birth, and Journal of Midwifery and Women’s Health. Results of the placentophagy RTC were also covered in the journal Science. Daniel Benyshek and Sharon Young readying to prepare a human placenta for laboratory analysis. In a broad sense, our research investigates the links between nutrition, reproduction, and cooperation. Our behavioral and ecological research takes place outside of the laboratory at Alyssa Crittenden's field site in Tanzania, East Africa among a nomadic population of hunter-gatherers, the Hadza. Our current research explores the cultural dimensions of kin investment, attachment theory (specifically models of multiple attachments), the behavioral and nutritional correlates of cooperative breeding, life history theory, the evolution of childhood, food sharing, and the evolution of the human diet. Graduate student, Trevor Pollom, using a mounted compass to measure wayfinding ability among child foragers during the summer field season, 2017. Alyssa Crittenden conducting 24 hour dietary recall interviews for a study on oral health and nutrition.